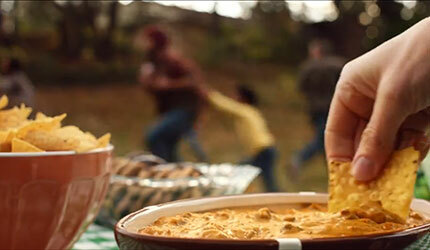 Check out these special game day recipes. CHECK OUT CHILI NATION'S FAVORITE RECIPES! Enjoy all the traditional flavors of America’s No. 1 chili. Premium chili made with 100% Angus beef! HORMEL® Angus Beef Chili contains no artificial ingredients, preservatives, or added fillers. Here’s another reason to love chili! You can satisfy chili cravings with the same delicious dish you love—now available in 100% natural! HORMEL® Chili 100% Natural is made with no artificial ingredients, is minimally processed, and has no preservatives added. It’s tough to top the taste of the longshoreman special. That would be chili, which is served with dabs and horseradish cream and can warm things up even in the thick of a January nor’easter. When it comes to chili, the First State puts New England brown bread first. Nicknamed “The Small Wonder,” Delaware knows how to satisfy big hunger with this perfect pairing of chili and bread. Pop on over to Maine for some popovers and chili! Savor this perfect pair of light, hollow rolls and hot, hearty chili. Now that’s a match made in flavor heaven. There’s a bounty of flavor in the bounty of the bay—including chili goodness, which Maryland serves up with a side of mouthwatering bannock bread. Massachusetts knows how to warm up in a deep freeze, and they know what makes for wicked good chili. They pair their bowls of chili goodness with soft buttered rolls. The chili’s great in the Granite State, where they know how to cut straight to the delicious with a side of bulkie rolls and sliced jalapeños. Talk about a trifecta of tasty! Delicious chili flourishes in the Garden State, where it’s served up with Colby Jack cheese, onions and hot jalapeños. That’s a tasty dish you can bet your money on to satisfy. New York brings its best to the chili bowl with a bounty of bagel goodness. There may be debate around which bakery’s got the best bagels, but there’s no doubt that chili’s delicious! In Pennsylvania, you’ll find a soft spot for hearty chili paired with a tasty soft pretzel. For the Keystone State, it’s an edible icon, and for Chili Nation, it’s a super-scrumptious side! Vermont knows how to top off chili with a side of scrumptious. White Cheddar and common crackers are the way to go in the Green Mountain State when serving warm, tasty chili. Put politics aside and warm up with chili. 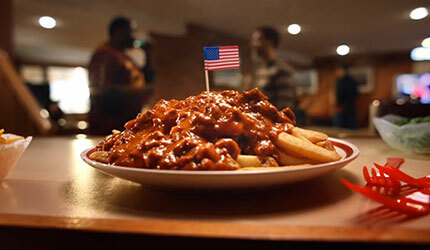 Bring some classic sides to your bowl—like French fries and cheese sauce—and stand united, one nation under chili. Sweet Home Alabama is home to the classic chili-and-buttered-cornbread combo. Savor ‘em separately or bring it all together in a casserole or “salad”—you can never go wrong with this delicious duo. It’s no surprise that chili love runs deep down in the South. In Arkansas, home to the World Cheese Dip Championship, great taste is teamed up for a terrifically tasty chili cheese dip. Where the sun shines, the chili shines, too. Floridians bring big flavor to their chili with a side of fried plantain chips for a delicious duo that satisfies all kinds of cravings. Georgia may be known for its peaches, but when it comes to chili the Southern route is the right way to go with grits and gravy—a top-notch trifecta of tasty! In the Bluegrass State, chili goes hand-in-hand with spoon bread, one of Kentucky’s tastiest traditions. Served as a side, or on the bottom of the chili bowl, these two make for top-notch tasty! The Bayou State brings delicious extras to their chili bowls, like tasty fried okra—also known as gumbo—dirty rice and hot sauce. The Big Easy sure knows Big Flavor! Mississippi dishes out lots of savory Southern dishes and flavors. In the Magnolia State, you’ll find chili enjoyed alongside yummy hush puppies. Talk about a mouthwatering match! North Carolina’s sweet on BBQ, which is why they bring it to their chili bowls, along with a side of savory sweet potato fries. They sure know how to dish out the delicious! In the Palmetto State, they know the value of enjoying life’s simple sides, so they top their great-tasting chili over white rice. Now doesn’t that sound nice? Tennessee’s got a taste for all sorts of good things—including chili. They serve it up with big BBQ flavor and crunchy corn chips. That’s the kind of tasty that can’t be topped! Virginians love warm, delicious chili best when served alongside a Southern-style, savory cornbread skillet. They might kick up the flavor even more when pairing with pickled jalapeños. Chili meets zesty in West Virginia, where it’s enjoyed with a side of tasty pepperoni rolls. A state staple in the Mountain State, pepperoni rolls pair perfectly with chili goodness. In the Land of Lincoln, chili gets yummy with a pair of unlikely but delicious sidekicks, French fries and pickled vegetables. It’s a team of tasty players that always makes for winning flavors. In “the Crossroads of America,” they like to complete their chili dish with a delicious side of fried biscuits. Now that’s a yummy team of tasty goodness! Just as few corners of Iowa are far from a cornfield, few bowls of chili go without corn (on and off the cob) and shredded cheese. Try and top that great-tasting trio! Kansas City barbeque is the pride of much of Kansas, so chili is proudly served with cornbread sticks and BBQ sauce. Now that’s some finger-lickin’ good chili! While it’s known as the country’s cherry capital, it’s safe to say, “Life is Just a Bowl of Chili” in Michigan. The Great Lakes State makes a great pairing with chili and Coney dogs. Do Minnesotans love chili? You betcha! Where the weather’s cold, the chili’s hot and served alongside wild rice, the official State Grain. There’s no tastier way to warm up a Minnesota winter. SHOW ME THE CHILI IN MISSOURI! Missouri smothers on the delicious with a chili-covered St. Louis toasted ravioli. It’s a merging of Midwestern warm, tasty and toasty that no one can resist. Roll out big chili goodness in Nebraska, where you’ll find it served with a tasty side of cinnamon rolls. It’s a tradition in the “Cornhusker State,” and a sweet one at that! North Dakota warms up with hotdish! Nothing beats a hot, hearty chili casserole when the temperatures dip below zero, and North Dakota’s got that one mastered. The Buckeyes bring the big taste of chili to all sorts of delicious fixings—like spaghetti, Cheddar cheese, onions and oyster crackers. It’s a lot of flavors for a lot of tasty. The Mount Rushmore State takes pride in greatness—and that includes great-tasting chili. They pair it with deep-fried and delicious frybread. That’s some simple, tasty goodness that’s easy to warm up to. In America’s Dairyland, cheese is king. It’s loaded on nearly everything—of course, that includes chili. So when in Wisconsin, eat your chili like a cheesehead! Don’t worry—you’ll be glad you did. The Grand Canyon State knows how to celebrate its Southwestern flavor. So don’t be surprised to see Arizonians get prickly if their chili’s served without their tasty hatch chilies! New Mexico’s got a taste for Southwestern flavor. Called “the Land of Enchantment,” you can be sure to charm your taste buds with their chili served alongside mini omelets and Spanish rice. The Sooner State knows how to savor the great taste of chili with classic corn fritters. A tasty tradition in the South, corn fritters fit perfectly with chili greatness. Don’t mess with Texas and its chili—they’ve even designated it as the official state dish! Try the corn chip chili pie, a hit at dinner tables throughout the Lone Star State. Weathering the winters of the Last Frontier is tough, but Alaskans know how to warm up when the temps drop. They cozy up to hot, tasty chili alongside sourdough bread. The chili shines in the Golden State, home of most fresh food trends. It’s only natural, then, that Californians like their chili with flavorful extras like avocado, olives, cheese and sourdough bread. As the gateway to America’s Southwest, Colorado spices up its chili with corn tortillas, jalapeños and rich sour cream. Now that’s a tasty Southwestern spin that’s sure to bring big chili cheers! Aloha from Hawaii! Even though the temps are anything but chilly here, the chili love is hot! The tradition here is to enjoy chili alongside SPAM® — “the Hawaiian Steak”— and sweet pineapple. Idaho marries its two loves, potatoes and chili, by adding potato skins to their chili bowls. It’s a top-notch tasty twosome that’s guaranteed to satisfy. There’s big chili flavor in Big Sky Country. Called “the Treasure State” for its mining history, Montana also knows how to treasure great-tasting chili, which is often served alongside buttermilk biscuits and butter. The chili’s gold in the Silver State, where it’s served alongside sour cream, cotija cheese and corn tortilla chips. Now that’s a delicious dish you can count on! There’s big love for chili in the Beaver State. They enjoy their chili bowls topped off with a fresh squeeze of lime and sour cream or yogurt, onions and cilantro. You might not know it, but Utah’s salsa savvy and chili crazy. It’s the key ingredient to great-tasting green sauces, and tomatillo salsa teamed up with chili makes for winning flavor. There’s no debate! Washington State produces amazing apples that taste great with everything—including chili. Tasty, tart, sweet or spicy, there’s no bad apple to pair up with chili! When in Wyoming, why not have chili and frybread? Deep-fried and delicious, it’s the perfect side for warm and tasty chili goodness.